Wild: Lording over the skies across the island, Argentavis atrocollum has few aerial rivals. It is a small consolation for the island’s other avian Creatures, then, that Argentavis seems to have little interest in anything alive. Although they are not interested in many animals, Argentavis will attack any human within sight making them an aerial threat to many humans with basic equipment. Domesticated: Argentavis is actually slower than the far more common Pteranodon, but it has significantly more Stamina, and can sustain flight for approximately three times as long. This makes them the best Creatures on the island for traveling or hauling cargo over long distances. 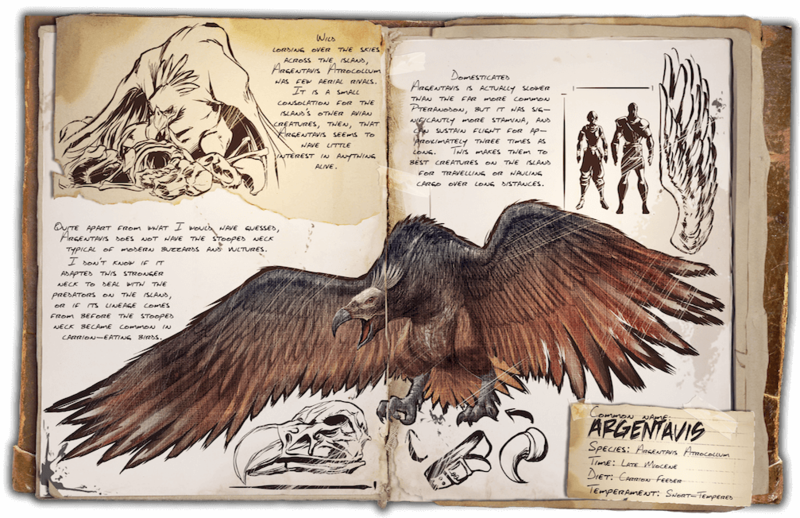 Known Information: Quite apart from what I would have guessed, Argentavis does not have the stooped neck typical of modern buzzards and vultures. It is unknown if it adapted this stronger neck to deal with predators on the island, or if its lineage comes from before the stooped neck became common in carrion-eating birds.